Ever have one of those nights where you’re late getting home, have nothing in the fridge, and just want a quick and filling dinner? Yeah that was me last night. After a late night trip to the grocery store to prepare for the feast coming up this week, I wanted something quick and easy. The wife even mentioned stopping off at Subway – but no, a Veggie Delight just wasn’t going to cut it. Something quick, tasty, and filling. Now we’re talking. There’s ALWAYS cans of beans in the pantry, And I’ve ALWAYS got onions and bell peppers handy. The trick to making these amazing little burritos taste so good is 2 things: The beans and the spice mx. I used a can of No Fat Refried Beans AND another can of Low Salt Pinto Beans. Stir in about a quarter cup of your favorite Salsa or Picante Sauce and yum! Beans are ready. Make sure you use both cans of beans – to me, just one or the other won’t cut it. For the veggies I used a cast iron skillet, half an onion sliced into fajita style rings, and a red bell pepper sliced the same. Stir fry these veggies in about 1/3 of a cup of water or veggie broth, and then splash in a few tablespoons of lime juice for that extra fajita flavor. But the Spice Mix is what adds that old world Mexican flare. And it’s surprisingly easy to make. You’re only going to use a few teaspoons, so you’ll have left overs for the next batch. And once you taste these awesome little bean rolls, you will be making more. Trust me. That’s it. Whisk this up in a small bowl and you got a seasoning that will match any of those stale envelopes at the grocery store. Stir 2-3 teaspoons of this mix into your veggies before the water’s all evaporated, and then watch it carefully. Once the water begins to dry up you want to stir a lot to keep it from burning, but just brown enough to get some little black specs in the veggies as they start to caramelize. I’m sure you don’t need me to tell you how to assemble a burrito. Just remember to fold up the bottom first to keep all the goodies from falling out. Throw some beans down the middle of your tortilla of choice, top off with some fajita style veggies, and you’re ready to rock and roll. I added some chopped tomato and shredded lettuce to mine. Quick, filling, and very tasty I might add too. From start to finish I had dinner ready in less than an hour, while only messing up two pans. 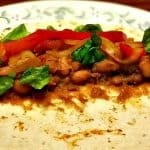 Quick and tasty Vegan Bean Fajitas using 2 type of beans, stir-fried veggies, and a homemade spice mix. Perfect for those late nights where you just want a quick and tasty meal. Drain and rinse the pinto beans. Add salsa and refried beans and simmer until warm. 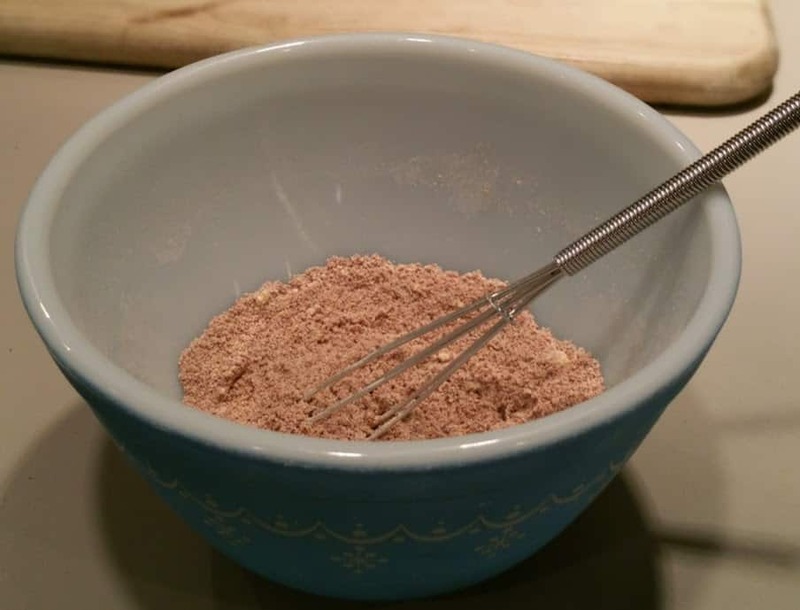 Whisk all Spice Mix ingredients in a small bowl. 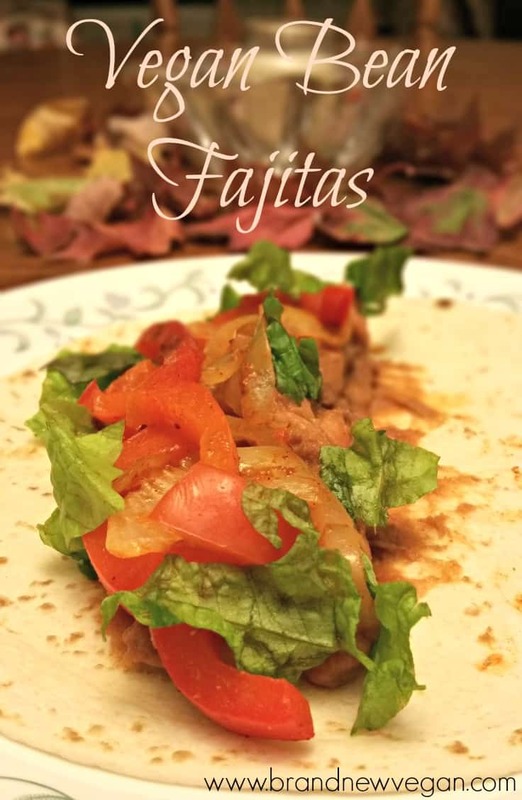 Assemble fajitas by placing beans in center of tortilla. Add stir-fry veggies and toppings of your choice. Very delish! I topped mine with a little kale (steamed on top of the veggies at the end) avocado and fresh tomato. Didn’t have any tortillas, but I did have some quinoa so I cooked that in veggie broth and seasoned it with some of the lime juice and a little garlic. No salsa either, so chopped fresh tomato, some of the onion and a little Cholula to season the beans. Made a bowl, instead of a wrap. 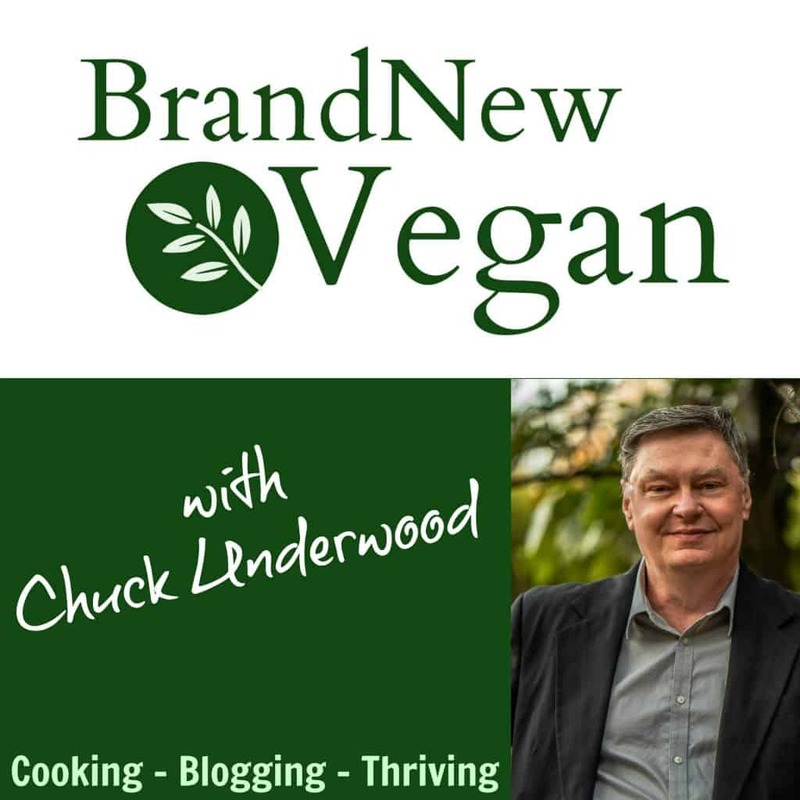 Credit to you for inspiring a thrifty tasty meal.